5.53 points at 15 votes (rank 715). 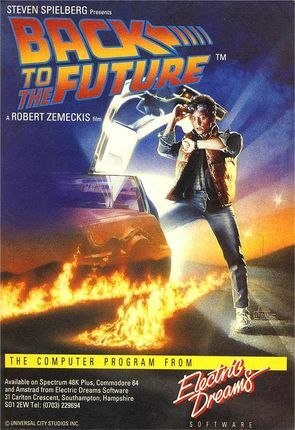 The movie: It is the 26th October 1985 when Marty McFly and his friend scientist Dr. Brown test a time machine, that the scientist has built into a sports car of the type DeLorean DMC-12. It is set to the 5th of November 1955 and due to adverse conditions Marty needs to use it. In the past, Marty meets George McFly, his future father, Lorraine, his future mother, and Biff, by whom his father still in 1985 gets suppressed and abused. Lorraine falls in love with Marty and by this threatens his existence, because without his parents getting together he will not get born. So he needs to get his parents to fall in love with each other at all costs. This mission turns out to be difficult, because George is -- as in 1985 - a shy outsider without any self-confidence. At a dance in the school Biff suddenly appears and harasses Lorraine. Then - as agreed - George appears; he knocks Biff out, whereupon Lorraine is enthused by George and falls in love with him. Then Dr. Brown succeeds in leading a flash into the time machine's flux compensator at the right moment, which enables Marty to return to the year 1985. The changes made by Marty in the past are not without effect in the present: His father George now has become a self-confident and succesful author, who employs Biff. 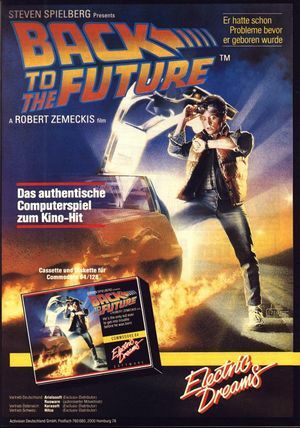 The game: In the game Back To The Future you take over the role of Marty McFly, the main hero of the blockbuster with the same name from 1985. Marty travels into the year 1955 with a time machine, where he needs to unite his parents to ensure his existence in the future. The screen is divided into three parts. In the upper bar there are five icons with symbols of items that you can use in the course of the game. If you stand in front of an item, the icon gets yellow, if you have one of those items, the icon will turn white. In the lower third there is an image of Marty on the left side and one of him and his two sisters on the right side. Depending on the development in the game, the images dissolve slowly or start to rebuild. 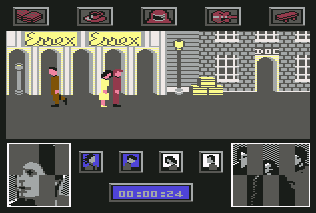 In the middle there are smaller images of the other characters in the game; Dr. Emmet „Doc“ Brown, George McFly, Lorraine Baines McFly and Biff Tannen. If these characters are near Marty, the corresponding image gets white. When they are "on the right track" the image gets green. 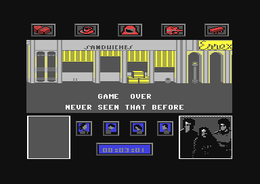 The game itself takes part between those two information bars. Here you steer Marty through the street and into five buildings. While the street scrolls fluently, the buildings are each only one room the size of a screen. Marty, Lorraine and Biff on the street. For the background music, two songs of the movie were converted: both songs can be called successful, the originals can definitely be recognized. Especially successfully done is the use of the songs: If it is going rather bad for Marty, the hectical "Johnny B. Goode“ by Chuck Berry is played, if it is going good, you hear „The Power Of Love“ by Huey Lewis And The News. : move Marty to the left or right. : enter or leave building. : use / put down item. The skateboard is the only item that is instantly used when picked up. punch into the corresponding direction. 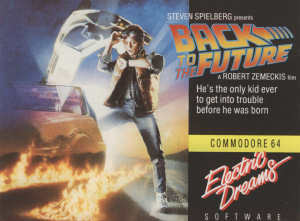 Marty McFly: Hero of the game, is of course steered by the player and is the only one who can use items. Dr. Emmet „Doc“ Brown: With streaming hair, the Doc scurries through the game. His only function is to scare off Biff, who always moves away from him. If the Doc is near Marty you are save from Biff's punches. George McFly: His stooped posture reveals him as the outsider without self-confidence. Marty's task to pair him off with Lorraine may not get easy. Lorraine Baines McFly: Emancipation was still a foreign word in the 50s. Correspondingly, Lorraine follows Marty at every turn without a will of her own. Biff Tannen: The roughneck without brains. His only task is to hinder Marty in his mission by punching him with his fists, so he is knocked out. Marty then sits dizzily on the ground for a few seconds. The streets: By the street you get to the single buildings. Futhermore you find the skateboard at the right and left border next to the wooden boxes, with which you can move significantly faster. You can also enter rooms with it, but you put it down as soon as you use another item. 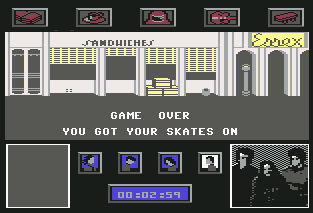 As long as you use the skateboard, you are too fast to get hit by Biff's punches. Doc: In Doc Brown's house is the alien suit. When you use the suit, George follows Marty. School: Here you find the book with the love poems. With the book you can also get George to follow Marty. Hall: The place where the Enchantment Under The Sea party takes place, where you need to pair Goerge off with Lorraine. The helpful item you find here is the guitar. Marty alone in the town hall after a KO punch by Biff. Sandwiches: Here you can get coffee with which you can distract Biff for some time. The items are available in the corresponding places in an unlimited amount. If you put down an item, it has disappeared after that and needs to be fetched anew at the original place, if needed. If you use an item on a character, it will always react in one of these four ways: it follows Marty, it moves away from Marty, it stops for some time or it does not react at all. With punches you can only disable Biff. The image of Marty is divided into eight parts, that disappear or rebuild one after the other. When all eight parts have disappeared or all eight parts have built up to a complete image, Marty loses or respectively wins a part on the image with his sisters. This image consists of ten single parts. When all parts are gone, you have lost the game. When all parts are complete, then George and Lorraine are a couple and you can get on your way back to the future. When the image of the family is complete, there is no time limit any more. 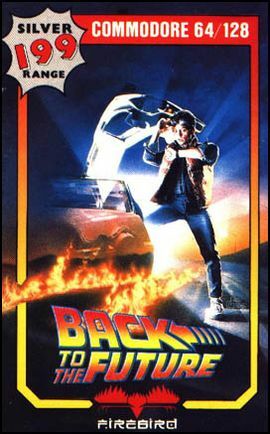 The game only needs to be finished by the ride in the DeLorean. With the difficulty grade that can be adjusted on the start screen you only vary the available time. In the first level there are still five parts of the right image left at the beginning, while in the fifth level it is only one part. At the start go directly to the school and grab the book. This now needs to be used on George who then follows you for some time. As Lorraine probably follows Marty anyway, go directly to the town hall. Here you now use the guitar with George and Lorraine, whereupon both stay still ecstatically. If they are standing close enough to each other, the images will build up as soon as you move away a bit. As one guitar is not enough to complete the right image, you need to use it again on the future lovers, if required. You need to take care not to get too close to Biff and that George does not leave the hall when the effect of the guitar has subsided. You do not necessarily need the coffee to solve the game. Biff can also be kept at bay relatively easy without it. As soon as Marty's parents are lovers you go into Doc Brown's house to get the time machine in the shape of the DeLorean. If you now leave the house it is already on the street. It starts and the game is over. Depending on how fast you have solved the game (or is it randomly generated? ), you get different messages at the end. They go from "Incwedibly Cwafty" (Incredibly Crafty), "Never Seen That Before" over "Welcome Back! 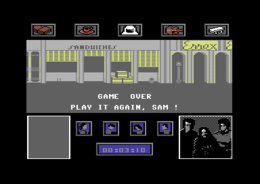 ", "Just About Time" to "Play It Again, Sam!". Back to the future with the DeLorean. POKE 17966,173 after the game has loaded for unlimited lives (not tested). Equinoxe: "A game with a for that time rather new and interesting idea. Furthermore they keep very close to the movie original. Unfortunately, they did not do well while converting. As soon as you have the hang of it, you solve the game within a few minutes. The motivation to play it once again after that is very limited. Therefore only 5 points from me." H.T.W: "At the start the game is pure hecticness and frustration. Not only that you instantly get punched by Biff if you stay still for a second, but also Lorraine sticks to you like a limpet (and by this subtracts energy) and this George with his escape tic is gone so fast that you almost cannot hold him. After some time you find some tricks how to get those two together and how you disable Biff for some time. As already mentioned, the motivation to bother with this game once more is very low. Conclusion: You do not really have to play that..."
FXXS: "Altogether there is just too little net playing time, as in the best case you only need to use two items (repeatedly) and punch Biff a few times. Why they have taken of all things the decay of the images as difficulty grade, is beyond me. 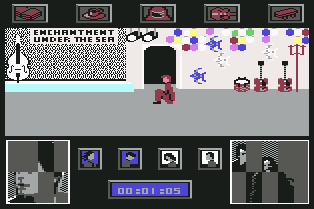 With a variably aggressive Biff and combined points for difficulty grade and the use of items, boxing and time there would have been at least an incentive for a highscore chase, but the way it is now, it is definitely uninteresting after finshing it once. Typical movie licence, where most of the budget is going to the rights owner. 5 points." The version by Softrunner is broken. As soon as the family screen is complete, it will crash. There are graphic bugs in the title screen. The version by Wasp seems to be bug-free, but also in the version by Hokuto Force (see Links) there are no bugs to be found. 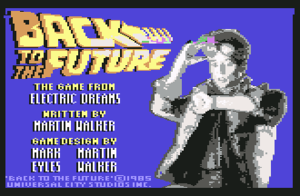 This version additionally contains the manual, the solution and the title screen. 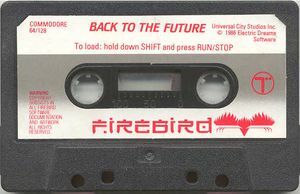 Front cover of the cassette version. This page was last modified on 10 October 2015, at 20:38.